Micro-defects: GSI For Fragmentation Assessment? Recently, SRK Chile was involved in a caving project in Chile and in charge of numerical modelling to analyse pillars and overall mine stability and to define ground support. The review of the basic geotechnical information was the first task performed, pointing out an underestimation of the Geological Strength Index (GSI). The client justified the lower values of GSI by including micro-defects, as they would be acting during the caving process, and argued that they should be included in the GSI estimation for fragmentation assessment by the software block cave fragmentation (BCF). SRK’s position in this particular project was that GSI need only consider open joints since BCF already considered micro-defects to calculate the rock block strength, and including micro-defects in GSI would have a double lowering effect. Because of this debate, SRK verified the impact on fragmentation curves due to including microdefects in the GSI estimation. GSI is not a direct input in BCF software, but it is used to scale the mi Hoek & Brown parameter to mb, which is an input parameter in BCF. 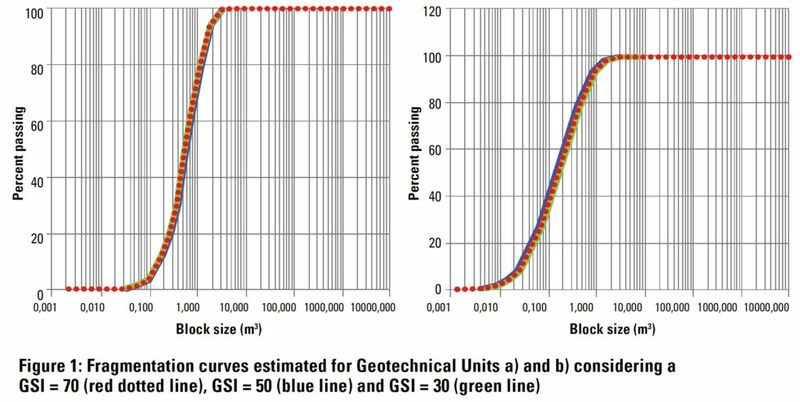 To evaluate the impact of micro-defects included in GSI, SRK estimates three fragmentation curves for two geotechnical units using mb input values scaled from a GSI value of 70, 50, and 30, resulting in three identical fragmentation curves. It may be concluded that micro-defects should not be considered for GSI estimation, since micro-defects are already explicitly included in BCF.